Another classic composed salad for summer, this version has its origins in Volume I of Mastering the Art of French Cooking by Julia Child and friends. Instead of pasta, rice, or quinoa serving as the base, French-style potato salad pulls everything together. 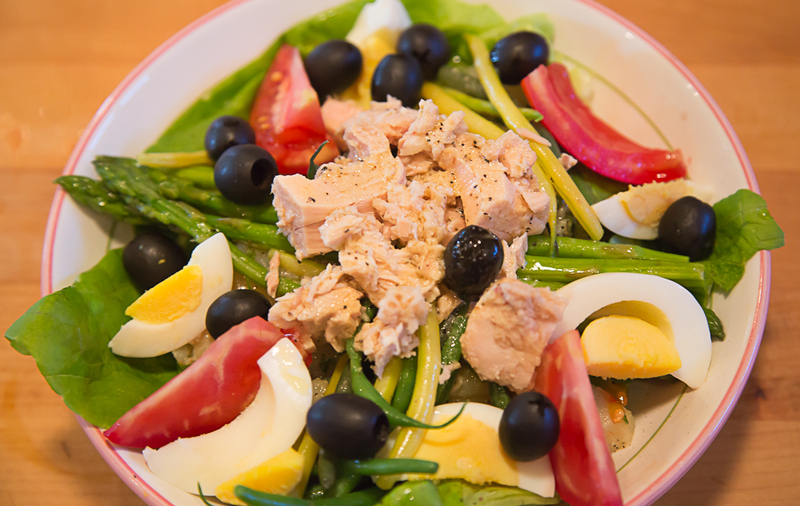 Haricots verts, hard-boiled eggs, ripe tomatoes, black olives, and canned tuna are essential. If you can find good-quality Spanish anchovies, they should also be included, but beyond that you are limited only by your imagination. Salade Niçoise can be served chilled or at room temperature, but it goes without saying that it needs a chilled white wine and crusty French bread to be a complete summer meal. Add the unpeeled potatoes to the boiling water. Return to the boil and cook until the potatoes are done and can be pierced easily with a sharp fork, about 30 minutes. Drain the potatoes and cool until they can be handled. Peel by pulling the potato skin off with a sharp paring knife. Slice the potatoes into ¼ inch thick rounds, return to the dry pot, and pour in the wine. Stir gently until the wine is completely absorbed. Add the vinaigrette, scallions, and parsley and stir gently until well combined, being careful not to break up the potatoes too much. Chill until ready to compose the salad. Sprinkle the olives over the top of the potato salad and arrange the tomatoes and eggs around the edge. Arrange the tuna, flaked gently with a fork, in the middle of the salad. Serve immediately. This will serve two, perhaps with some leftovers.